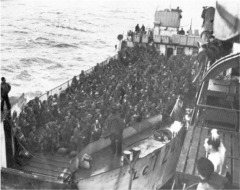 Soldiers of the Highland Light Infantry, 9th Brigade disembark from an LCI and wade through heavy surf towards the beach in front of Bernieres-sur-Mer at 11:40 hours on June 6. Mass drop of the 1st Battalion from Douglas Dakota aircrafts, Salisbury Plain, England, February 6th, 1944. 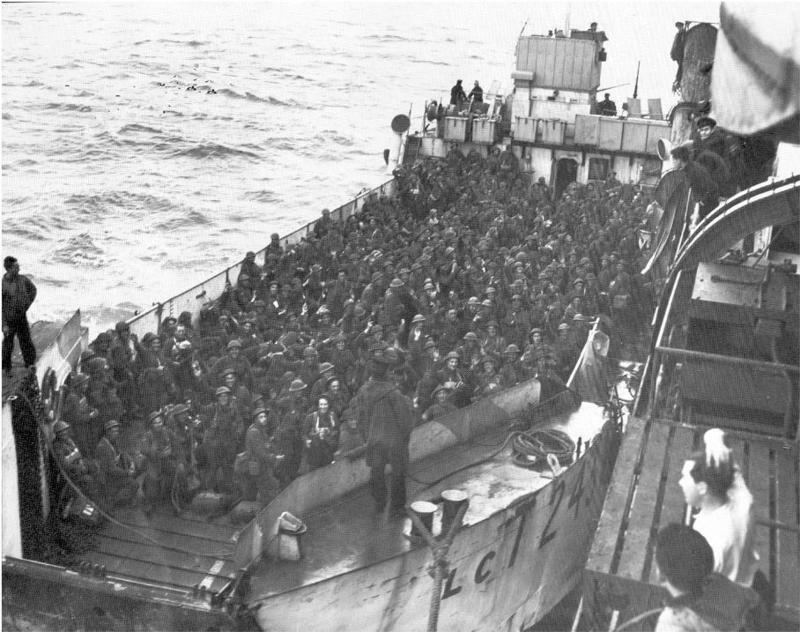 By the end of D-Day, the Allies had landed more than 150,000 troops in France by sea and air. 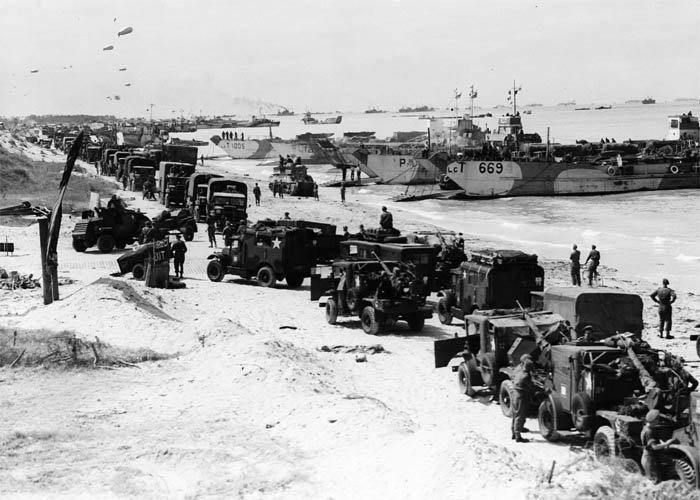 Thousands of vehicles, hundreds of guns and about 4,000 tons of supplies had also been landed. 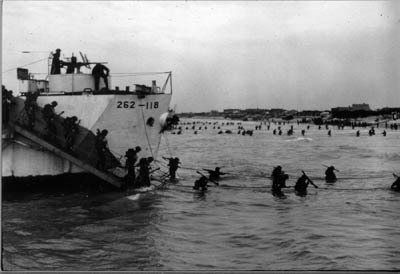 More soldiers and supplies were pouring ashore to continue the advance on D-Day-plus-one. 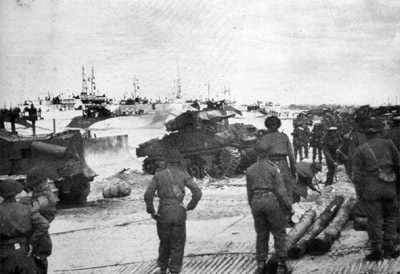 Build-up of tanks and vehicles on Courseulles-sur-Mer Nan Green beach. 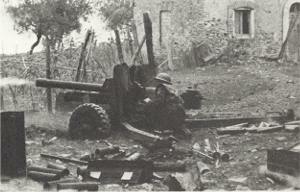 The 5.5 Inch gun-howitzer was used by the Canadians as a medium artillery weapon. It fired an 82-pound high-explosive projectile up to 18,200 yards at two rounds a minute. 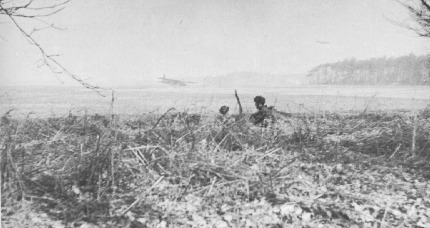 It was operated by a ten man crew. 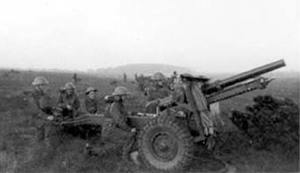 The 6-Pounder was the main anti-tank gun of the Canadian infantry units and anti-tank regiments after 1942. It's effective range was 1000 yards. It was usually towed by a Univeral Carrier. 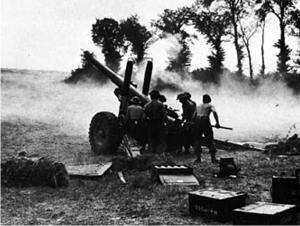 The 25-Pounder was the main gun used by the Commonwealth field artillery. It could be used as a gun, firing armour piercing shells at a flat trajectory or as a howitzer firing high explosive shells at a high angle. It was effective up to 12,500 yards and up to 13,400 with a supercharge. The Armoured Vehicle Royal Engineer (AVRE) was a Churchill tank mounted with a "Petard" spigot mortar (large calibre short range gun) that could throw a 40-pound "dustbin" about 150 yards. 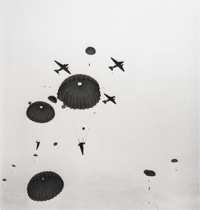 It was used by the engineers to destroy concrete emplacements including concrete barriers, roadblocks and pillboxes.